In 1545 France and England were at war. King Henry VIII of England sent his fleet into the Solent (the stretch of sea that separates the Isle of Wight from the south coast of the English mainland) to counter a surprise attack launched by the French. 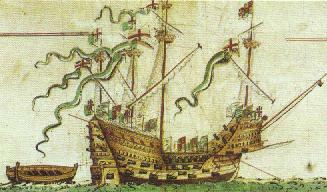 His flagship - the Mary Rose (named after the King's sister) had a crew of some six to seven hundred men. The weather was quite calm. With a light wind blowing, the ship hoisted its mainsails and attempted a tight turn in order to face the enemy. At that point the boat started to capsize, quickly became flooded and sunk. Only 30-35 of the crew survived. The dramatic event took place in full view of the King. Three centuries later, between 1830 and 1840, the Deane brothers found the wreckage of the Mary Rose and brought several objects to the surface including some longbows. The position of the wreck remained unknown until Alexander McKee located it once again during the 1960s. The Mary Rose foundation was then created with the ambitious aim of raising the wreck from its resting place. Before undertaking such an operation the archeological site surrounding the ship had to be studied in detail and as many artefacts as possible had to be recovered and brought to a safe keeping place. In 1979, under the direction of Dr. Margaret Rule, a member of the diving team brought back the first longbow to the surface. This first discovery was quickly followed by many others including several bow coffins containing longbows in surprisingly good conditions of conservation. One of the experts who examined the first longbows brought up, said that they looked like they could have been made the previous week! In all, 140 longbows (mostly made of yew) and 2500 arrows survived more than four centuries in the muddy depths of the Solent and were recovered by Dr. Rule's team. The British actor and historian Robert Hardy (author of two reference works : Longbow and The Great Warbow) was asked to examine the recovered longbows. During two years, Mr. Hardy carefully dried the bows in a specially-prepared room with precise heat and humidity control. The next step involved studying the manner in which the bows were made and trying to estimate their draw-weight. The data that has been accumulated during these years of experiments allows us to form a much clearer picture of the warbows that were used at the end of the middle ages. The Mary Rose longbows were made some one hundred years after the battle of Agincourt but much evidence suggests that the warbow had changed very little during those one hundred years. Alexander McKee's dream at last came true on october 11, 1982 when the wreck of the Mary Rose was carefully lifted from the muddy waters of the Solent after more than four and a half centuries. Today the remains of the ship are housed in specially built dry dock. Visitors can see the ship at the Historic dockyards in Portsmouth. A visit to the Mary Rose Foundation website will give you an excellent idea of the adventure of the Mary Rose. According to Professor B. Kooi's estimations, the Mary Rose longbows varied in draw weight from 100 to 180 pounds. The biggest group of draw weights being in the 150 to 160 pound range. Several contemporary bowyers (Pip Bickerstaffe, Celestino Poletti, Steve Stratton to name but a few) are once again making longbows to the specification of those found on the Mary Rose. Visit the Archers du Genevois encampment and see a Mary Rose replica warbow in action.